The official opening of the new plant (from left): Kurt Sauernheimer (Executive Vice President Door Systems Brose Group), Scott Garberding (Head of Group Purchasing Fiat Chrysler Automobiles), Jürgen Otto (CEO Brose Group) and Luigi Di Battista (General Manager Brose Melfi). 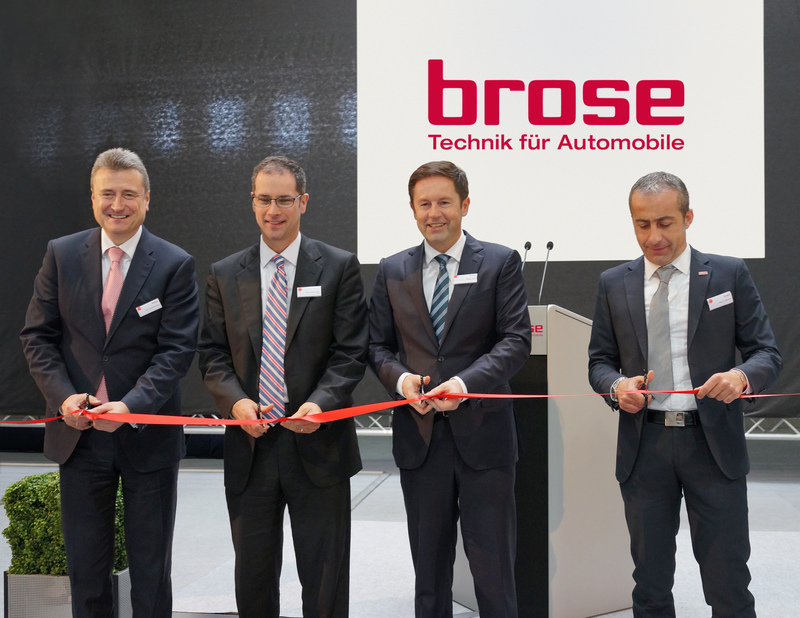 Brose, the automotive supplier with global operations, has officially opened its first Italian production plant in Melfi. The company decided to expand its production capacity when it received its first contract for door systems from Fiat. The mechatronics specialist will start by producing door systems for the Jeep Renegade and Fiat 500X on the 4400m2 site, supplying products for around 400 vehicles per day. The first phase of development created around 70 jobs. The opening ceremony was attended by 40 guests from government and industry. Piero Lacorazza, Chairman of Basilicata Regional Council, welcomed the company in the presence of Jürgen Otto, CEO of the Brose Group, saying: “I am delighted to welcome Brose, a global player, to the region.” Luigi Di Battista, General Manager Brose Melfi, expressed his thanks for the effective, uncomplicated support provided by the local authorities and Brose’s customer, Fiat. Jürgen Otto. Brose has invested over 4.3 million euros in the new location, which will employ up to 80 people by the end of the year. 150 percent by next year. Brose combines mechanical, electrical and electronic components on a carrier plate. This improves functionality and saves costs, while pre-tested units lead to higher quality standards. Consistent lightweight design and the novel material combinations used in the door systems help reduce the total vehicle weight by around three kilograms. already produces door systems for the Fiat Viaggio for Fiat’s Chinese joint venture with GAC. The mechatronics specialist also has a long-standing relationship with Fiat subsidiary Chrysler. To help its customer meet its growth targets, Brose will be following Fiat to Goiana in Brazil next year, where it will produce door systems for the same Fiat vehicles and other model series in close proximity to its customer.